Influenced by prominent English economist Thomas Malthus (1766–1834), people in the nineteenth century began to fear that the planet Earth might not produce enough food for its growing population. Yet it turns out that Malthus was wrong. Although the world's population grew from 1 billion (in 1804) to 6 billion (in 1999), a global food shortage failed to materialize. Agricultural machinery, artificial fertilizers, and improved seeds were among the many products that were invented or developed to help accommodate the growing population. Of course, now as it was then, there are many hungry people in the world. Living mainly in the developing countries , a third of the world's current population, or about 2 billion people, are considered undernourished. Of those, about 500 million children suffer from inadequate or unbalanced diets. Throughout the 1960s and 1970s there occurred a "Green Revolution" in which scientists, through selective plant breeding, developed highyielding varieties of key food crops, especially wheat, rice, and corn. Relying substantially on these varieties, India for several years in the 1970s was able to feed its population of almost 1 billion, and still have grain left over for export. The Indian state of Rajasthan experienced a record-breaking drought in 2000, considered the worst in 100 years. The drought caused an acute shortage of water and animal feed. 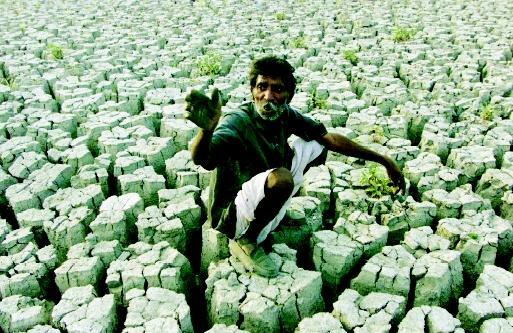 Here a farmer crouches on the dried bed of Lake Rajsamand. Of at least equal importance was the availability of irrigation. In India's breadbasket, the Punjab, water for irrigation came either from a state-operated canal system drawing water from the Indus River or from shallow wells equipped with small pumps installed by the farmers themselves but with electricity supplied by state-operated power lines. Toward the end of the twentieth century, growth in the extent of irrigation began to taper off with a decline in some countries. Scarcity of water was a key factor in several regions including the Middle East, North Africa, Sub-Saharan Africa, South Asia, China, Mexico, and Brazil. As a result, growing water scarcities gave rise to serious political conflicts. Food shortages lead to unwanted migrations across national borders, and to cut-and-burn agriculture that causes soil erosion and damage to tropical forests. International agencies like the United Nations and the World Bank play a key role in deciding what actions to take in order to circumvent food shortages. There are several factors, outlined below, that must be considered when deciding on such actions. Population increases plus the desire for more meat in the diet will greatly raise the global demand for grains. In China, for example, grain production is presently reaching limits and is expected to decline substantially in the coming decades (as shown in part (a) of the figure below). Although the global output of grain rose greatly during the 1960s and 1970s, there has been little or no rise since 1990. World grain prices soared in 1995 and may double by 2010. Moreover, the area of grain land per person has been dropping (as shown in part (b) of the figure below), caused by growing urbanization and deterioration of agricultural land. Fertilizer use worldwide has decreased since 1990, since the increased yield due to its application has become too small to be profitable. Major aquifers are being overpumped, including those of the Punjab of India and Pakistan, North China, northwest Mexico, and the Ogallala in the western United States. Rapid urbanization is increasing competition for scarce water and reducing its availability for agriculture. Other water-related negative effects are being caused by salinization (salt buildup in soil), pollution , soil erosion, and flooding. Other than scarce water, serious impediments to agricultural production in the developing countries results from fragmentation of landholdings, poor land management, and ineffective macroeconomic policies with respect to land tenure, land taxation, subsidies , and export and import taxes. Global warming, largely caused by burning of fossil fuels, could result in climatic changes that would affect agricultural production, the availability of water, and the frequency and duration of floods. Arable land on the planet, totaling about 1.5 billion hectares (5.8 million square miles), is almost fully utilized. 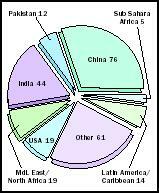 The one-sixth that is in the irrigated sector worldwide, about 250 million hectares (970,000 square miles), will have to be the main supplier of the increased demand (see the pie chart). However, its output will have to be greatly increased in order to meet the demand. Except for the very small amount of fresh water derived from the seas through desalinization , the volume of fresh water available for human use approximates the amount of precipitation, less evapotranspiration , less what becomes locked in glaciers and ice sheets, less what runs off to the sea. Worldwide, this amount is estimated to average 40,000 cubic kilometers (9,600 cubic miles) annually, and it is a ceiling that cannot be exceeded. In other words, consuming fresh water faster than it can be naturally replenished will reduce and ultimately deplete supplies if the use goes unabated. Because water can rarely be transported economically more than a few hundred kilometers, the local and regional amounts of available water are what matters, not the global amount. Many dams that store flood runoff, which would otherwise flow to the sea, have already been built. Because few opportunities exist worldwide for the additional construction of major dams, the alternative is conservation . Conservation must include reduction of per capita domestic use, reduction of losses caused by pollution, and increase in the efficiency of water use by irrigation, which globally is by far the biggest water user. Extensive tropical-humid zones with monsoon-type climates exist in South and Central America, Mexico, Sub-Saharan Africa, and South Asia where there is scope for intensifying agricultural outputs through "supplemental irrigation," which means supplying water for occasional dry spells or to advance planting dates, thereby taking better advantage of the monsoon . Owing to their wetness, such zones must first be drained. Irrigation can come later, as a supplement. Drainage of wetlands must be carried out with caution so as to reconcile the conflicting demands of agriculture, urban development, transport, and ecosystem maintenance. The Everglades in Florida is an extensive wetland system whose major portions were drained artificially to create land for cities and for agriculture. Water also has been diverted to meet primarily agricultural needs. Now there is the realization that the Everglades may have been overdrained, causing discharge to the sea of precious water needed to recharge aquifers—the source of water for the cities of South Florida—and to preserve habitats for wildlife. A comparison of irrigated land areas in the world (in millions of hectares) show that China and India surpass the United States in amount of land under irrigation. In arid countries like Egypt, nearly all cropland is irrigated. The world total is 250 million hectares. In addition to overdrainage, serious pollution problems in the Everglades have arisen that endanger the aquifers and marine fisheries. Much of the pollution is from fertilizers, pesticides, and chemicals used for the cultivating and processing of sugarcane grown on the drained land. The problems of the Everglades are now being rectified but at high cost to the federal government and the taxpayers of Florida. A much larger wetland, the Pantanal in Brazil and Bolivia, is at an early stage of development and faces similar problems. SEE ALSO Agriculture and Water ; Everglades ; Florida, Water Management in ; Hydropolitics ; Hydrosolidarity ; Irrigation Management ; Population and Water Resources . Brown, Lester R., ed. State of the World—1995. New York: W. W. Norton & Co.,1996. International Irrigation Management Institute. "Feeding the World." IMMI Review, Table 1. Colombo, Sri Lanka: IIMI, 1994. Kirpich, Phillip. Water Planning for Food Production in Developing Countries. Lanham, MD: University Press of America, 1999. A shallow well is generally any drilled or dug well with depth below ground surface not exceeding 10 meters (33 feet). In areas without electricity, water is lifted out of the well using manual or animal-driven devices. A motorized pump, if provided, is at the ground surface with the end of its suction pipe immersed below the water surface in the well. Decrease in water use by irrigation must be accomplished without impairing food production. It may be possible to replace high-water-demand crops with low-water-demand crops that also have higher value. For example, fruits, vegetables, and flowers can replace relatively high-water-demand crops such as rice, wheat, and sugarcane. The water saved, called "virtual water," can then be shifted to other uses.